It takes a little time to make crust and then the filling, but doesn't it look worth the effort? So now you know why I was talking so much yesterday about blind baking quiche crusts. I didn’t pre-bake mine...and it came out soggy. I don't really mind it so much, but others do. I came into possession of way too many eggs a few days ago (gifted, not by raiding the hen house…) so I decided I had better look up a recipe or two to use them. Quiche fit the bill – and a slot in the dinner schedule. Quiche is thought of today as typically French because of its obvously French name. But custards baked with meat and vegetables were known in other European countries at least as early as the 1300s. That’s a very long time. Sprinkle the (pre-baked!!) crust with cheese. Regardless of what you call it, quiche is a great way to serve a well rounded meal in a highly transportable form – a pie. It can be reheated with little to no ill effect for picnics or buffets. 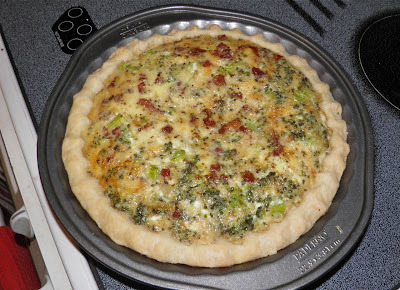 In fact quiche is often better after being allowed to cool and fully set up. 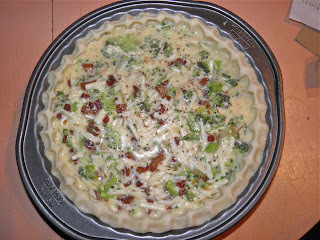 This particular recipe is based on a traditional Quiche Lorraine (bacon quiche), with some changes. Pork belly – don’t be grossed out – is substituted for the bacon. Pork belly is actually just bacon before it is seasoned, smoked and sliced. In reality, using pork belly probably isn't that far off the mark. 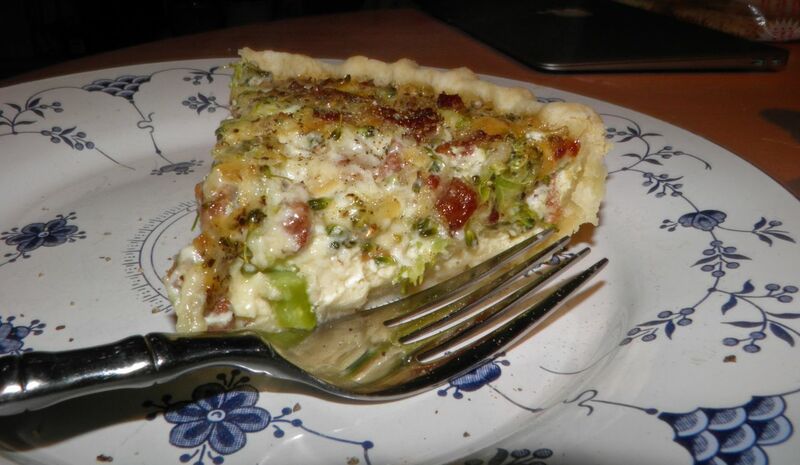 Quiche (and its cousins) are all country-style recipes so a "country" cut of meat is more than likely appropriate. You can buy pork belly in thick strips at the grocery, or you can ask for it unsliced from the meat counter. (Can anyone say "homemade bacon"?) The cut is actually quite affordable. The fat renders out the same way as bacon when fried and you are left with crispy chunks of meat. It may be a possible substitute for people who have to avoid the salt in bacon, but there is no smoke flavour. The fat is all still there as well, so "six of one, half a dozen of the other." I think pork belly is every bit as good, although I do miss the smokiness and salt in some uses. Note: A quick way to enjoy pork belly for breakfast is to fry it like bacon – with a difference. As it fries sprinkle it with salt and WAY too much cracked black pepper. Also throw in about 1/4+ cup of whiskey or bourbon. As the alcohol evaporates the flavour permeates the meat, in a way substituting for the flavour of smoke. The sugars in the alcohol also act as a sort of glaze. A perfectly baked quiche is a wonderful hearty thing. Try your hand at this one and then think up variations. What about bacon/scallop, or sausage/spinach? Just remember the basics are eggs, milk and cheese. 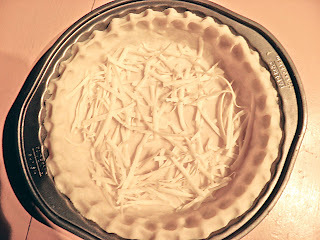 Oh, and pre-bake the darned crust. Preheat the oven to 350°F. Line a 9 inch pie plate with pie pastry. Blind bake the crust for 25 minutes. Cook the pork belly until well browned. Then add the onion and cook until it is softened. Set aside. Do not drain off the fat (unless you really have to). 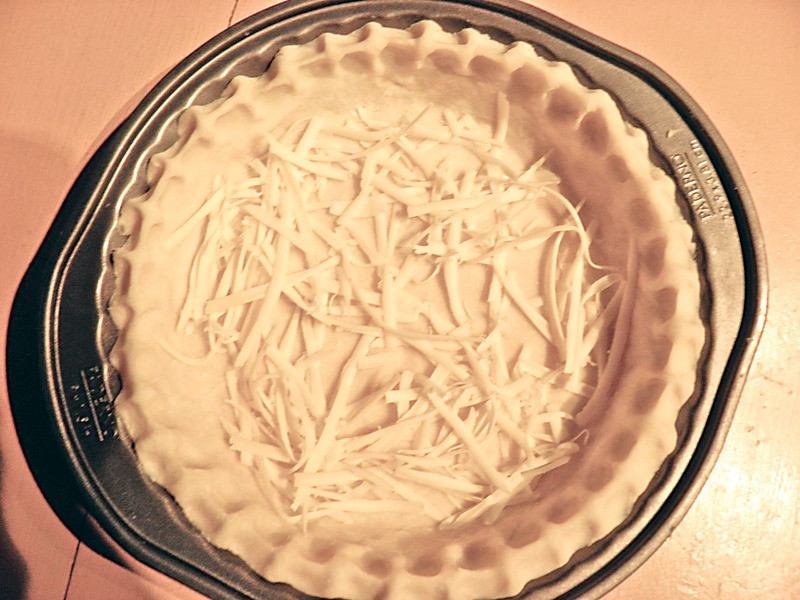 Sprinkle 1/2 cup of the grated cheese over the bottom of the pre-baked crust. Whisk together the eggs, milk, butter, garlic, salt and pepper in a bowl. Stir in the broccoli, pork belly, onion, and the remaining 1 cup of cheese. Pour the filling into the crust and bake for 45 minutes or until the eggs are set. Remove from the oven and let sit for at least 10 minutes to cool. Slice into wedges and serve with a side salad. 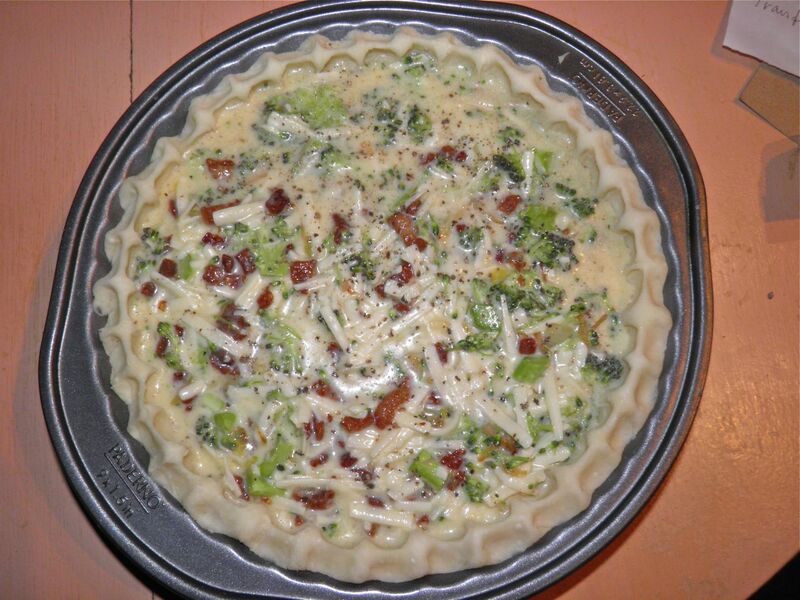 Let the quiche cool after baking. This lets the custard set-up firmly. Even better, let cool completely and then re-heat before serving.